﻿Meet Logan. He is a 6 year old leukemia patient from Michigan. On April 16th 2009 at the age of 1 he was diagnosed with B cell acute lymphoblastic leukemia. This was obviously devastating news to his family. So at the age of 1 he started chemo and radiation. Then in March 2011 during his treatment he relapsed. He received higher doses of chemo plus radiation after this first relapse. In June 2013 Logan once again relapsed. After the second relapse he received 2 more weeks of radiation and chemotherapy followed by a unrelated donor bone marrow transplant on October 16th 2013. On March 26th 2013 I was able to interview "Brave" Mykayla and her parents Brandon and Erin. "Brave" Mykayla is the 7 year old girl who's parents have chosen to treat her cancer with cannabis oil. During the interview we talk about what type of cancer Mykayla had, why they chose cannabis oil and they even talk about their method and regimen of treatment. We even talk about not having a choice whether or not to treat their daughter with chemo. That's right, doctors force them to do chemo on their daughter for 3 years or they will be turned in to children protective services. 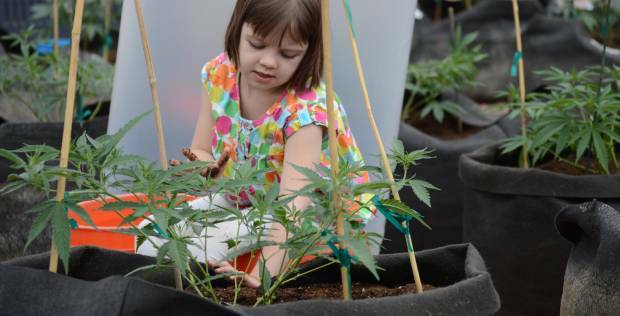 Medical marijuana is gaining acceptance, but could it even help kids? Dr. William Courtney has seen it happen, and on Friday, told HuffPost Live host Alyona Minkovski about it. Saying he was "quite a skeptic 5 or 6 years ago", Dr. Courtney continued that "my youngest patient is 8 months old, and had a very massive centrally located inoperable brain tumor." The child's father pushed for non-traditional treatment utilizing cannabis. "They were putting cannabinoid oil on the baby's pacifier twice a day, increasing the dose... And within two months there was a dramatic reduction, enough that the pediatric oncologist allowed them to go ahead with not pursuing traditional therapy. "The tumor was remarkably reduced after eight months of treatment. Dr. Courtney pointed out that the success of the cannabis approach means that "this child, because of that, is not going to have the long-term side effects that would come from a very high dose of chemotherapy or radiation... currently the child's being called a miracle baby, and I would have to agree that this is the perfect response that we should be insisting is front line therapy for all children before they launch off on all medications that have horrific long term side effects." ﻿This is the story of 5 year old Charlotte Figi. Charlotte suffered from Dravet Syndrome, a severe form of epilepsy found in children. From the time she was 2 she was having over 300 seizures a week which drastically affected her ability to learn, speak or even walk. She was unable to keep up with her twin sister. She was catatonic and nothing the doctors could do for her helped. All of their “medicines” had no effect on her condition and if anything they made her worse. Some of them almost killing her.